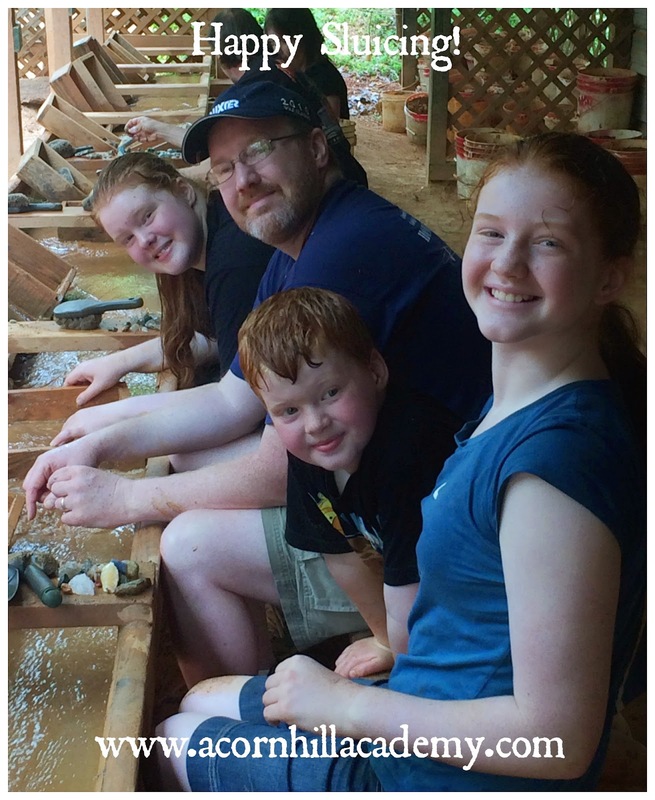 We are fortunate to live near several gem mines in North Carolina, and one thing we've enjoyed doing as a family is going to the mines to see what interesting things we can find. 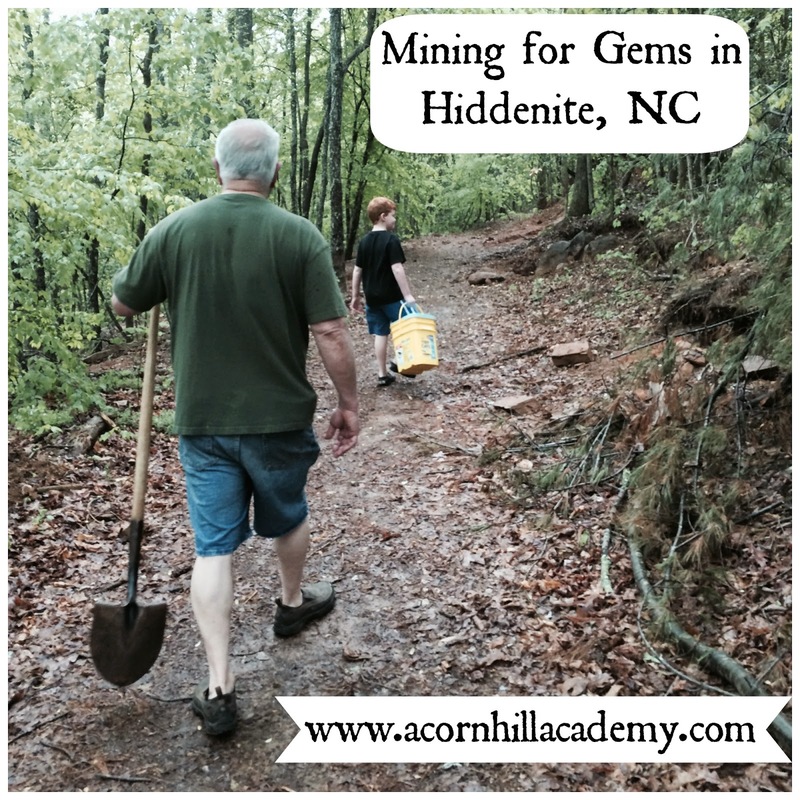 We've been to Hiddenite Gems' Emerald Hollow Mine a few times, and we went there again today. 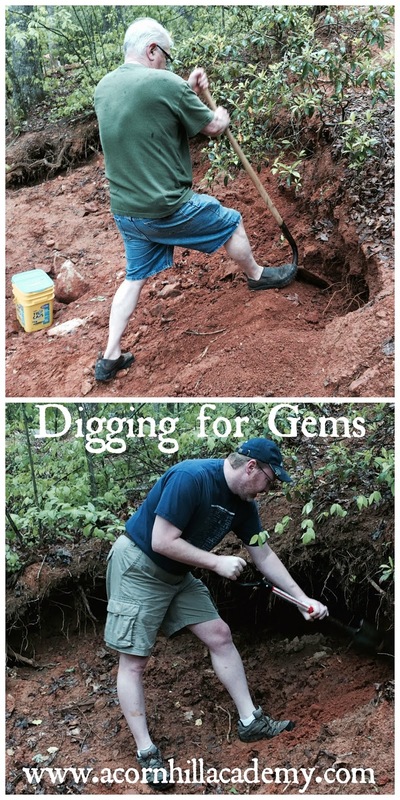 My dad is visiting, and he took Isaac there on Friday, thinking they'd dig their own dirt and look for gems that way. Previously, we've purchased already-dug buckets of dirt and rinsed through them in the sluices, which are long troughs with running water. Unfortunately, Friday turned out to be a field trip day at the mines, so there were too many school kids there for them to be able to dig, so we decided to try again today. We wandered back through the woods as we looked for a likely-looking spot to start digging. My dad and my husband did most of the hard work. Dad did find a vein of rock, but it wasn't quartz and mica, which is what the folks who run the mine had told us are associated with finding gems. Todd found a little bit of mica, and so did Abbie, but the dirt was so soft we felt it had probably washed down from digs up higher on the hill and wasn't indicative of a vein. 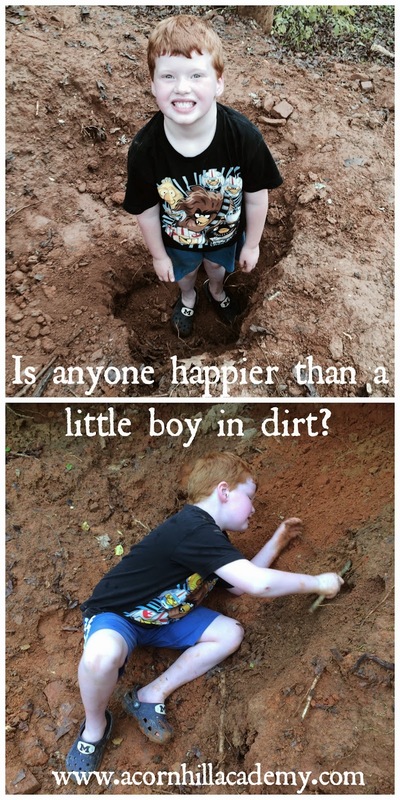 Isaac was happy as, well, a boy in dirt while we were in the woods. There are holes where others have dug all over the place, and he was able to dig anywhere he liked as long as he stayed inside the white tape telling us we couldn't get any closer to the river. He jumped in all the holes he could find and then found a "digging stick" and was digging for all kinds of things - he described the magic crystals he was finding as he poked around. I kept an eye out for wildflowers, and we found some lovely ones, which I will post about soon. We dug for a while, but when it started thundering, and then raining hard, we decided to head back up to the sluices. We ended up getting some buckets to wash in the sluice, which is always fun. We found a beautiful garnet, and we're having it made into a cabochon so we can have it set in a necklace or ring or something. I had an idea while we were there. Have you ever seen those little cards you find at tourist places, with small rock samples from the state you're in pasted on them? I have one from Michigan, but have never come across one for North Carolina. I would like to start a collection of North Carolina rocks. I'm going to ask the people at the Hiddenite mine the best way to go about that, I think. I've never looked for rocks intentionally, just picked them up along the shores of Lake Superior (every year - I have buckets and buckets of pretty Lake Superior rocks), but really haven't seen anyplace here that makes for easy rock collecting. I do know there is a local lapidary club, though, so I'm going to try to get in touch with them, too. Have you done any local rock collecting where you live? I have a friend whose son is trying to get rocks from all 50 states, and I sent him a lovely Lake Superior rock last summer. That's a cool idea too.